Hiking is a wonderful family activity, but not all hiking trails are wonderful for families. A good hiking trail for mixed family groups that include young children or older members should be short (under 3 miles or so) and not too steep. It should also feature some interesting attraction—such as a lake or waterfall—so children will feel they're going somewhere and not just trudging pointlessly through the woods. Here's a list of great family hikes in the Salt Lake City area, any of which makes for a memorable and affordable family outing. Bell Canyon, also known as Bell's Canyon or Bells Canyon, is a circular, glacier-carved canyon adjacent to Little Cottonwood Canyon. It's accessed from two different trailheads near the entrance to Little Cottonwood Canyon. The canyon offers a number of options to hikers, including two short, easy routes to Lower Bell Canyon Reservoir, and more strenuous hikes to a set of waterfalls and Upper Bell Canyon Reservoir. Lower Bell Canyon Reservoir is appropriate for beginners and children, the lower waterfall is a strenuous intermediate hike, and the upper reservoir is a strenuous all-day hike. Cascade Springs is a series of terraced springs and small waterfalls surrounded by boardwalks and an easy, half-mile interpretive trail. It's spectacular from late spring through fall, and kids enjoy seeing trout in the crystal-clear water. Cascade Springs is one of the most beautiful features of the Alpine Loop Scenic Byway, which can be accessed via Heber Valley, Provo Canyon or American Fork Canyon, and is open from late May through late October. Note: There is a per vehicle fee to enter American Fork Canyon. Donut Falls is a popular family trail about 9 miles up Big Cottonwood Canyon near the Jordan Pines picnic area. The trail is relatively short and easy though a little rugged, leading to a waterfall where Big Cottonwood Creek goes through a doughnut-shaped hole in the rock. The trail is 2.5 miles total using the Mill D trailhead or 1.5 miles total using the Donut Falls trailhead. Adventurous types can explore the cave behind the waterfall, but warn children not to climb the cliffs around the falls because they can become trapped. This trail is popular with snowshoers in winter. The Jordan River Parkway provides a year-round natural getaway within the city. The best sections of the parkway for families are Murray's section, which features 5 miles of paved trail, picnic areas, boardwalks, playgrounds and restrooms, and the South Jordan section, which has restrooms. The asphalt sections of the trail are accessible much of the winter. Lakes Mary, Martha, and Catherine, also called the Brighton Lakes, are accessible by a relatively short, moderately easy trail that starts at the parking lot of Brighton Ski Resort. The trail is 4 miles total for all three lakes and gains a little over 1,100 feet in elevation. The first lake and the easiest to reach is Lake Mary, and families with young children will want to turn around here. The next and smallest lake is Lake Martha, and the highest and prettiest lake is Lake Catherine. 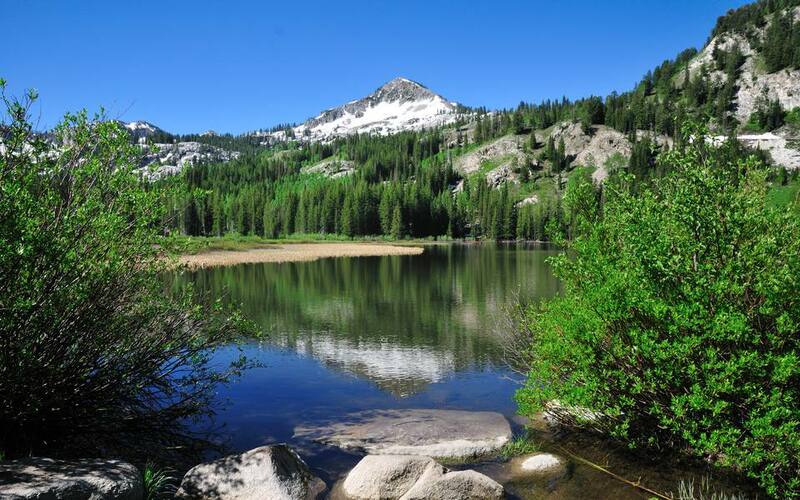 From Lake Catherine, it's possible to hike over Catherine's Pass and end up at Albion Basin Campground in Little Cottonwood Canyon. This hike can also be done in reverse starting at Albion Basin Campground. The Living Room trail leads to a ridge overlooking the Salt Lake Valley above Red Butte Garden and Arboretum where people have arranged flat slabs of sandstone into chairs, sofas, tables, and ottomans for hikers to relax on while they take in the view. It's a popular trail but not marked well with signs, so consider using your GPS. It's especially nice at sunset. The living room can be crowded during summer, especially in the evening. The Scout Falls trail is the first section of the Timpooneke trail leading to the summit of Mount Timpanogos. It's accessed via American Fork Canyon, which requires a fee per vehicle to enter. The trailhead for the Timpooneke trail is about 7 miles up American Fork Canyon—take the Timpooneke turnoff just past Mutual Dell. Scout Falls is a delightfully refreshing waterfall (though it may dwindle to a trickle during dry periods), and it's a nice place to have a picnic before heading back down the trail. The trail is 3 miles total and moderately easy, gaining about 600 feet in elevation. The Silver Lake Trail at the Brighton Ski Resort is the easiest, most child-friendly hike around—just a short boardwalk stroll around a small Alpine lake. There's a visitor's center with children's activities and plenty of ground squirrels to keep the kids amused. On the far side of the lake, other trails lead to Twin Lakes and Lake Solitude. Don't confuse Brighton's Silver Lake trail with the Silver Lake trail in American Fork Canyon, which is a lot of fun but moderately difficult. Timpanogos Cave National Monument up American Fork Canyon consists of three spectacular caverns accessible to the public with a one-hour guided tour. The Timpanogos Cave trail is 1.5 miles each way and gains 1,000 feet in elevation. It's a little steep but doable for most. Strollers are not allowed, though the trail is paved. Cave tours are limited and sell out frequently, so it's best to reserve tickets in advance.